Maintaining a well-run, popular senior fitness program in a CCRC can be tough. Often just managing the independent living fitness center is a full-time job for someone. Then, as residents move through the continuums in a community, they often start to miss out on the robust programming that was offered to them in independent living. So, what happens when a manager wants to extend programming into assisted living without adding a huge burden on themselves? One answer could be to simply modify existing programs to better fit the assisted living population. This way, managers save some time with planning and can use many of the same program materials (which means saving money, too). One of the simplest ways to change an incentive program is to take it from an individual effort challenge to a team goal. For example, if the goal of the program in IL is to have a resident achieve 15 group fitness class visits over the course of a month, maybe the goal for AL would be to have the entire group achieve 35 group fitness classes over the month. Obviously, the goal numbers will depend on availability of classes and residents who want to participate, but you get the idea. Take it one step further and create a tracking poster to keep in the assisted living fitness area so residents can keep up on their progress. Another way to make sure your assisted living program is successful is to involve some volunteers. Let’s say you’re doing a one-mile walking event for IL and you want to run the same event in assisted living. For IL, you can probably just market the event, promise some water and granola bars at the “finish line,” and residents will come out to participate. You could try the same thing in AL, but it certainly wouldn’t go over as well. Instead, try recruiting volunteers (either staff or residents) and pair up with people while they walk. This way, your walk becomes not only about physical health, but also about social wellness and emotional wellness. Plus, most people would think of this event as an activity rather than just exercise, and so they are more likely to attend. This isn’t actually a modification because it works equally well in both levels of care, but it’s still a great way to make the program a success. People love a recognition for their work. In assisted living, this can mean getting a little creative. Yes, you can stick with the typical throw-a-party-for-participants-at-the-end-of-the-program reward. Or you can try something a little different. 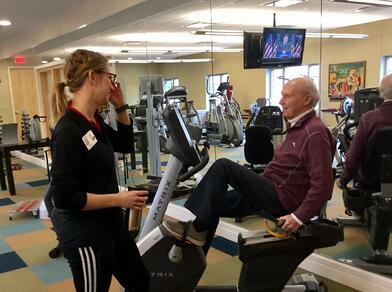 When family and friends visited, residents could brag about their fitness center participation. It brought more attention to the program and other residents started asking about how they could earn snowflakes. What other ways can you think of to modify existing independent living programming for other areas of the community? Interesting in knowing how our staff can impact your fitness program? Download our quick read, simply click below. 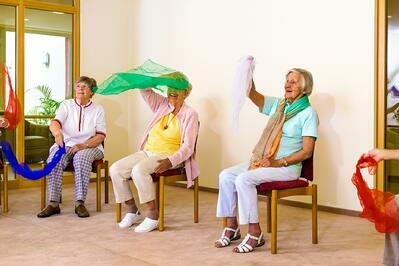 While we've seen significant progress in what exercise can look like for residents in independent living (IL), for many communities, there remains something of a disconnect in making sure residents throughout the continuum of care have access to the same or similarly robust services and amenities. The IL residents at a community often have a fitness center, pool, robust group fitness calendar, and individualized services available to them and in many cases as they transition to AL or other areas of care on campus the drastic decline in available options shifts them from a professionally managed health and fitness program to chair-based exercise classes lead by an activities professional. This is not an equitable approach. How do you answer questions about options for exercise in higher levels of care? 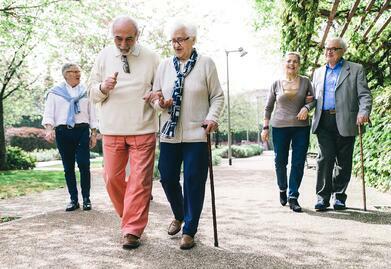 Whether you work in a standalone AL or memory-care community or in a Life Plan (CCRC) environment, prospects and families inevitably ask about the physical activity options that are available beyond billable rehab services. They understand the importance of keeping the mind and body in motion as part of a daily lifestyle. Does your community have a good answer for these questions that demonstrates robust options that are purposeful and executed by trained staff specially for residents who need a higher level of care? How do you support residents after they finish therapy? In licensed areas, residents often have rehab services readily available to them and that might seem like an easy "exercise" solution. However, billable therapy has limits. How do you support residents when they are discharged after 6-8 weeks of therapy and eliminate the revolving door of improved function leading to a discharge from therapy services followed by a decline due to lack of physical activity options which leads them back in therapy again? How do you facilitate resident moves to higher levels of care in a way that provides them with consistent access to exercise options? If you operate a Life Plan community with a robust fitness program for your IL residents, how do the residents’ options compare in terms of amenities, programs and services, and qualified staffing as residents move through the continuum? Having a continuation of offerings can be a great comfort as residents transition from one part of the community to another and it’s a valuable demonstration that the lifestyle they buy into in IL truly carries with them with whatever level of care they might need on campus. Want to learn more about how you can build more comprehensive exercise services for your residents?